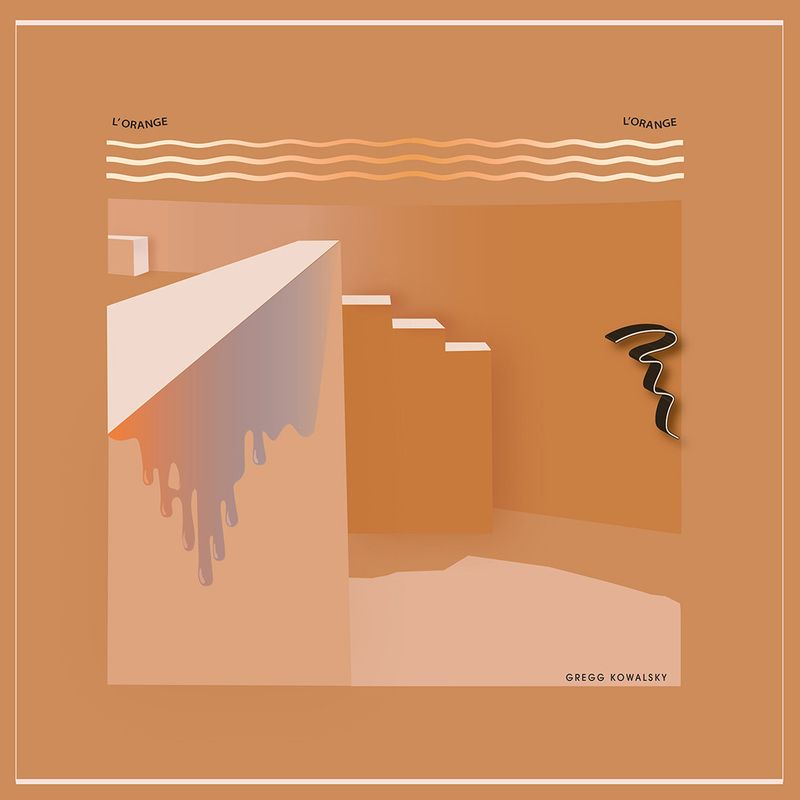 Brainwashed - Gregg Kowalsky, "L'Orange, L'Orange"
Date Palms’ Gregg Kowalsky has been atypically quiet over the last several years, as his last solo full-length was 2009's inspired and fitfully mesmerizing Tape Chants. I am a huge fan of tape loops, so it would have absolutely delighted me if Kowalsky had spent most of the last decade secretly deepening and perfecting that side of his art. It is certainly possible that he has been, but L'Orange, L'Orange is not Tape Chants II. Instead, Kowalsky consciously set out to make an album that "felt like a human made it." He certainly succeeded at that, as L'Orange, L'Orange is a warm, drone-based twist on Date Palms' sun-dappled psychedelia. Aesthetically, it also shares some common ground with a lot of the Cluster-loving analog synth fare so much in vogue these days, yet the best moments achieve a lushly enveloping, meditative bliss that is uniquely Kowalsky-ian. I suppose it would be somewhat reductive and misleading to describe L'Orange, L'Orange as Kowalsky's "California album," as he is a Mills College alum that has been a Californian for quite a while. The California of his current home of Los Angeles is quite a different place than the Bay Area, however, and this album is a very deliberate reflection of Southern California's clear blue skies, endless sun, and perfect coast (it is no coincidence that Malibu is directly referenced in one of the track titles). Kowalsky's surroundings are not the only thing that has transformed over the ensuing years, however, as L'Orange marks a significant change in philosophy as well. Aside from the aforementioned move towards warmth and humanity, Kowalsky has also embraced quiet simplicity, eschewing anything resembling his cassette-based installation work for twinkling and serene synth drones. In some ways, that transformation is a hard sell for me, as I am most drawn to tormented iconoclasts obsessively working in seclusion and Kowalsky now seems like the exact opposite of that: L'Orange is almost beatifically calm and radiant. There are almost no sharp edges or dark undercurrents roiling beneath the surface of these seven pieces–just dreamy, drifting contentment. The only real exception is "Ritual Del Croix," which casts some shadows across its tranquil idyll with some frayed textures and ominous swooping synth tones. Fortunately, the execution elsewhere can be quite wonderful as well, as Kowalsky has a strong intuition for textural variation, effective layering, and small-scale dynamic transformation. When he hits the mark, the results can be quite sublime. He does not always hit the mark. However, L'Orange is an assured and consistent album with no real missteps (though the opening "L'Ambiance, L'Orange" ends a bit too abruptly for my taste). To choose a metaphor that Kowalsky himself might appreciate, this album is a placid bay on a warm summer day as a light breeze gently rustles the surrounding palm trees. It is certainly a enjoyable and calming place to be, yet it is more of an ambient pleasure than something that commands attention. Much like, say, Malibu, however, there are some achingly beautiful vistas that offer quite a bit more than that. One such vista on L'Orange is the absolutely sublime "Pattern Haze," a wonderfully hissing and gently pulsing bit of drone heaven. Elsewhere, "Maliblue Dream Sequence" is similarly lovely, beautifully balancing a swirl of warm, hazy harmonies with the heft of deep, melodic bass tones. There are also a couple of enjoyable (if less substantial) piano pieces. The better of the two is "Tonal Bath For Bubbles," which marries rippling, cascading piano runs to a slowly flanging, hallucinatory haze and some gently burbling synth pulses. "Blind Contour Drawing for Piano" has its own appeal though, resembling a tender Harold Budd piece filtered through a healthy amount of tape decay. It is somewhat amusing that L'Orange, L'Orange was released on the eclectic Mexican Summer label, as it is very much a quintessential Kranky album by a quintessential Kranky artist: understated and quietly beautiful ambient drone music of the highest caliber. As such, L'Orange should have no trouble finding an audience, but it is more like a familiar old friend or comfort food rather than an exciting breakthrough. I would personally prefer a more adventurous Kowalsky to a reliable one, but a good album is a good album: covering well-traveled territory is hardly problematic if it is done well. Kowalsky does it well. Obviously, there are some exasperating glimpses of a possible superior album in highlights like the absolutely wonderful "Pattern Haze," but that could be said of almost every album ever released: few artists ever release albums featuring wall-to-wall classics. Most albums do not have any at all, in fact. L'Orange, on the other hand, features a couple of real gems. The rest is just fine by me, as this is a solid and thematically coherent suite of songs–I am glad to have another Gregg Kowalsky album in the world. I may not be exactly the target demographic for this particular release, but I definitely appreciate the nuance, craftsmanship, and uncluttered simplicity that he brings to the form.